When I woke up this morning, I thought I’d see if I could get through the day without writing a post about Paul Ryan. 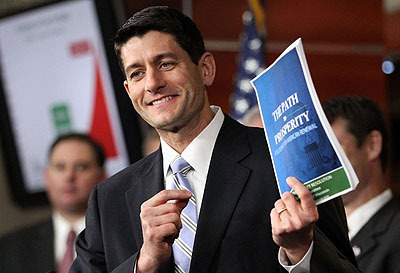 After all, this is a guy whose philosophy is pretty simple: Cut taxes on the rich and cut spending on the poor. Everything else is just window dressing. But so far, in my morning scan of my RSS feed, about 90% of the posts I’ve seen are about Ryan. Seriously. It might be higher. So I give up. Paul Ryan it is. But which posts should you read? If it’s fun you want, check out Jane Mayer’s quick summary of Ryan’s adolescent attachment to Ayn Rand — an attachment that apparently lasted at least through his mid-30s, waning only when it became politically inconvenient to admit his devotion to an atheist thinker in the tea party era. Dave Weigel has more here. Ryan’s budget — which Romney has endorsed — keeps Obama’s cuts to Medicare, and both Ryan and Obama envision the same long-term spending path for Medicare. The difference between the two campaigns is not in how much they cut Medicare, but in how they cut Medicare. Obama’s Medicare reform plan isn’t that hard to find. It’s largely in Title III of The Patient Protection and Affordable Care Act. It’s worth saying there’s no particularly good evidence for either option. Competition hasn’t worked very well in the health-care system. Indeed, Medicare currently includes private options through the Medicare Advantage program. The idea was these private, managed-care alternatives would be cheaper than traditional Medicare. As it turned out, they ended up costing about 20 percent more. As for the pay-for-quality revolution that the Obama administration envisions, that hasn’t been proven at Medicare’s scale, either. This is true. Nevertheless, the truth is that Obamacare contains loads of provisions for cost control, far more than anything Ryan has ever produced. Will they work? Nobody knows. And the plain fact is that we won’t know until we’ve given them a serious try. But they’re there. And not just in a vague, sound-bite friendly white paper, but in actual legislation, passed only after grueling effort. If anyone deserves credit for tackling the long-term cost problems of Medicare, it’s Barack Obama, not Paul Ryan. However, if you’d like the rare (!) sight of me kinda sorta saying something nice about Ryan’s Medicare plan, check out this post from March. I wouldn’t support it as-is, but it does demonstrate a welcome movement from his earlier plans. Coming from an ideologue like Ryan, that’s not bad.